Sitting at the large boardroom table in his office, Dr. Jack Kitts (MD ’80, EMBA ’01) is the first to admit he’s come a long way from his childhood ambition of working at the liquor store in his small Ottawa Valley hometown. 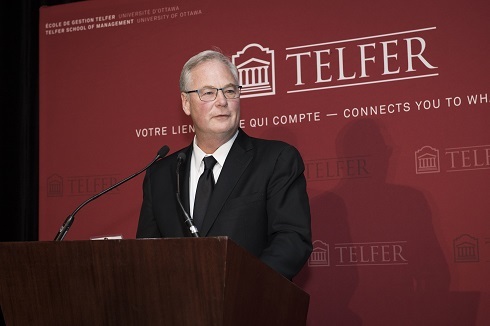 He has been president and CEO of The Ottawa Hospital since 2002, and this summer, he was named to the Order of Canada. Things are bustling on this late summer morning at the hospital’s Civic campus. Footsteps echo through the corridor that runs the length of the red brick building that has defined Carling Avenue since the early 1920s. Occupied these days by a huge hospital development project to replace the aging building, Dr. Kitts took time to sit down and reflect on nearly 40 years as a physician and medical administrator. Where were you when you found out you had been named to the Order of Canada? I was here in my office at about 8 in the morning when my secretary said there was a call from the Governor General’s office. It was really out of the blue and definitely overwhelming. You hang up the phone and wonder if they had the wrong name! It was one of those rare times in my life when I was truly shocked and speechless. What does a recognition like this mean to you? I really wish I had more pins to share with all the friends, family and mentors who helped me get here. Is there anyone you would like to single out? First is my mother. I grew up in the very small town of Barry’s Bay, Ontario, the second-oldest of nine children. My dad passed away suddenly when I was 16, leaving my mom a 36-year-old widow with nine kids. But she was adamant that I go to university. The second is my high-school guidance counsellor. In Grade 11, he called me into his office and asked about my future plans. He then suggested that, while a job at the local liquor store would be an honourable career path, I should consider getting a university degree. Thanks to him and my mom, I ended up at the University of Ottawa to complete a qualifying year, the beginning of my path to medical school. Finally, so much credit goes to my wife. She was a nurse at the hospital where I interned, and this year we’ll have been married 38 years. We have three incredible children and now three grandchildren. Are there memories from your time at uOttawa that stand out? I remember my mom bringing me to the University to register on a hot summer day. I’ll never forget the first time I saw the incredible Tabaret Hall and thinking there were more students on that lawn than in my hometown! Every time I go there now, it takes me back to that day when I was a young student in awe and very intimidated. What guiding principles have led you to where you are today? Barry’s Bay is a small community of 1,200 people. Everyone knows each other, waves and smiles at each other. If someone is having a tough time, everyone rallies to take care of them. I think it’s because of this upbringing that I’ve always lived the values of respect, compassion and collaboration. I now know from experience that when these are the things that guide you, people will want you to succeed. Doors will open and, as a leader, people will want to follow you. When you think about the future of healthcare, what you do see? I think we’re about to enter a golden era where there will be more healthcare advancements in the next decade than occurred in the past 200 years. Artificial intelligence will be commonplace and hospitals much more efficient, eco-friendly and focused on wellness rather than treating disease. And the role of the physician will change. I never see human contact disappearing but physicians will be better equipped with information systems and technology, allowing them to deliver the highest quality of care based on their patients’ needs. What advice do you have for the new crop of medical students arriving at uOttawa? I often tell young medical students: Not only are people watching you, they are judging and getting an impression of you. You don’t have to be something you’re not, but if you behave in a respectful, compassionate and collaborative manner, they will respect you. 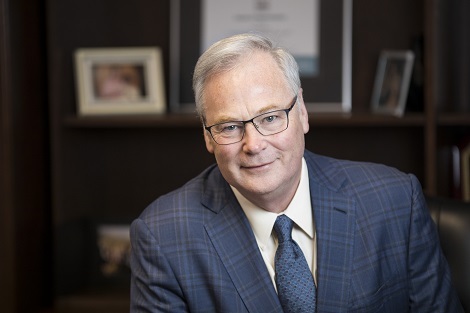 Earlier in his career, The Ottawa Hospital’s chief executive Dr. Jack Kitts specialized in anesthesiology and spent three years as the anesthesiology department head. He also completed a three-year tour as a medical officer in the Canadian military.